Hi everyone! I'm Amy, and most of the sewing/upcycling I do is for my two little kiddos. I'm excited to share one of my favourite projects with you as my first blog post. This one is great for using up those old T-shirts. It's even more fun when you tie-dye or fabric paint the shirts first. 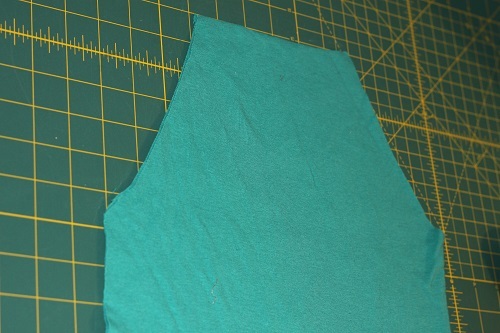 Also, the part I find tedious about making shirts out of knit yardage is finishing neck and sleeve openings. Upcycle a couple of your old t-shirts and you can just use the existing hems. 2. Place your child's shirt on top of the first T-shirt. 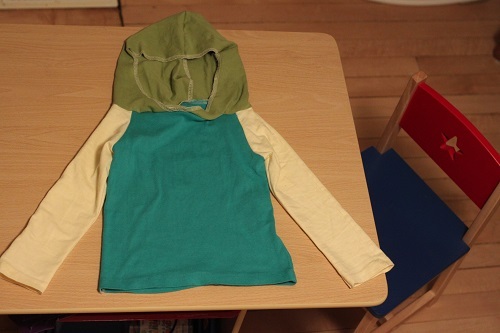 Fold the sleeves and hood back, so that you can see the shape of the main body of the shirt. 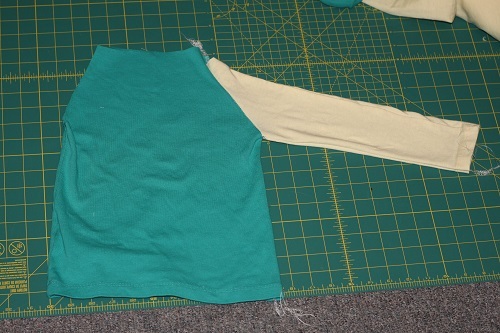 If you want to cut down on the seams you will have to sew, align your child's top along a side seam, so that the new shirt only has one side that has to be sewn up. 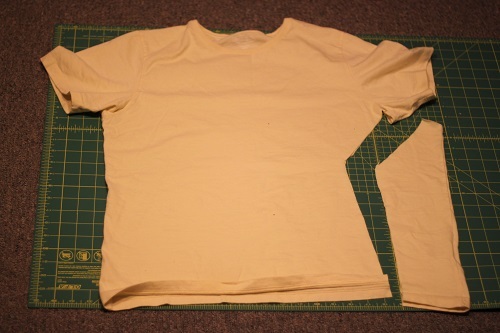 Using your rotary cutter and cutting mat, cut around the main body of the shirt, leaving a one-inch seam allowance. You should now have a front and a back piece. 3. 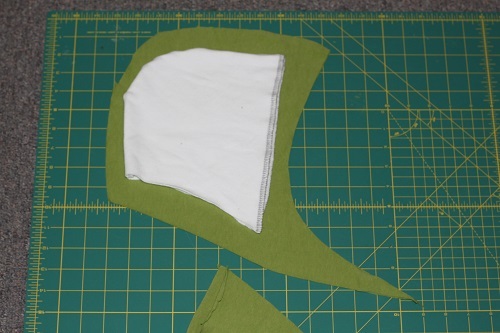 Lay your pieces (front on top of back, wrong sides facing) on your cutting mat, and trim the armholes for symmetry. I'm a bit of a sloppy seamstress, since I don't particularly like to use patterns, but that's the beauty of owning a serger. 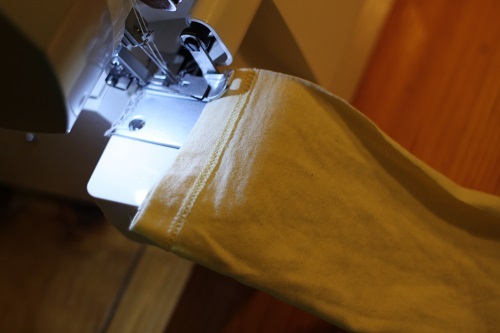 If your pieces are more or less the right size, the serger evens it out for you, since it cuts the fabric as you sew. 4. Lay your original shirt on top of old shirt #2, and align the sleeve against the side seam with the cuff lined up with the bottom hem. Cut around the sleeve. 5. 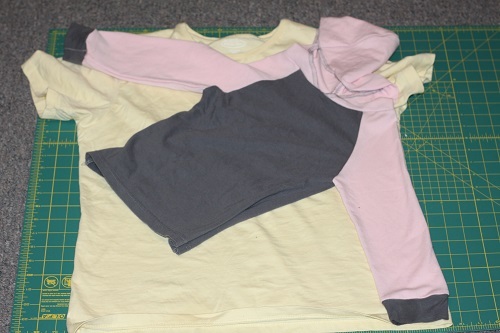 Now take the sleeve you just cut, flip it over (so that you're cutting it's mirror shape) and align it with the side seam on the other side of the old shirt. Cut out your second sleeve. 5. Turn the sleeves inside out. Sew the open sleeve sides. 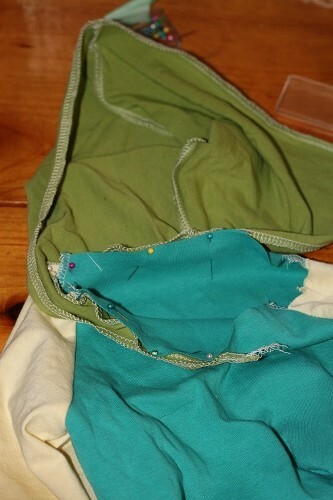 Start at the hem (cuff opening) and sew upwards, so that the hems are aligned at the wrists. 6. 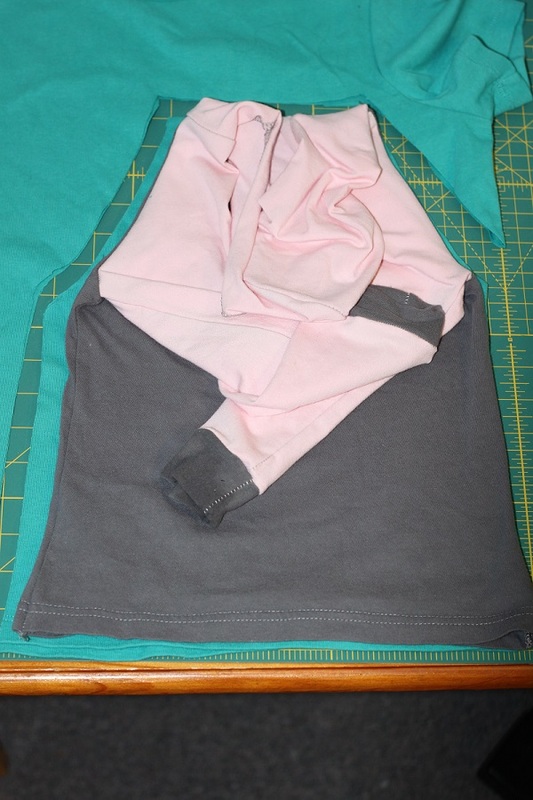 Turn the body of the shirt so that the right sides of the fabric are together, and sew up the open side seam. Start at the bottom, so that the bottom hem is nice and even. 7. Keep the body of the shirt inside out. 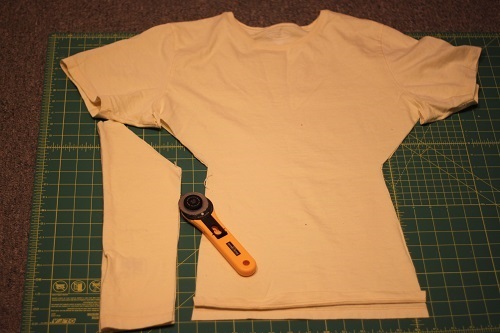 Turn a sleeve right side out and place inside the body of the shirt, aligning the underarm seams. Pin together and sew in a U shape. 9. Repeat for the other sleeve. If the tails are too long, you can always overlap them at the front, which looks cute, or just cut them off as you're sewing with your serger. 12. 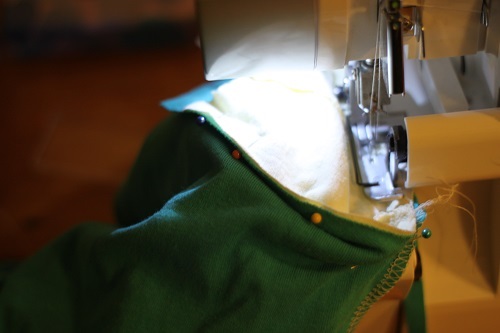 Finish the face seam of the hood - you know, the one that goes around the face. Hey, I'm newish to sewing, and I don't really use patterns, so I'm making up my own terminology here ;) You could just serger-seam it, or you could iron it over 2" and zigzag stitch it if you're using a regular sewing machine. 13. Pin your hood to the neck opening. 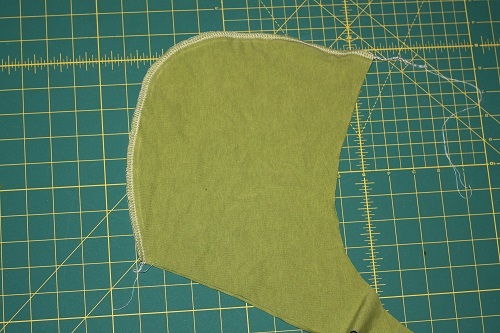 With all pieces of the shirt right side out, align the center seam of your hood with the middle of the main back piece. Start pinning there, and pin all the way around to the front on both sides. If the tails overlap, that's great. You at least want them to meet. Sew in place. 14. Finish your thread tails, and you're done! P.S. For future posts, don't forget to add your username -- Amy Rotini -- in the label area! That readers can keep track of your posts in the lists on the left side. Thanks so much! Love this outcome and would love to make one for my son! Thanks for sharing the step-by-step for us :) Looking forward to more refashions to come!